Presenting Be Charmed, a Texture Expansion for Elfdance: Charmed by Goldtassel & Swam. Feeling Magical? Enchanted? Maybe you want to Spellbound your fairy? As a bonus, this pack comes with Two Beautiful Fantasy Backgrounds created specially for your 3D Renders. 1500 x 1500 pixels each. Perfect for commercial or personal artwork! 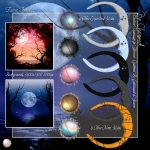 Inside you will also find 5 new textures for the Moon -prop, and 5 new textures for the Crystal ball-prop! Requires Aiko 3 figure and Elfdance: Charmed by Goldtassel & Swam (Renderosity).